It is Italian for unrelenting rigor, the favored motto of Leonardo Da Vinci. 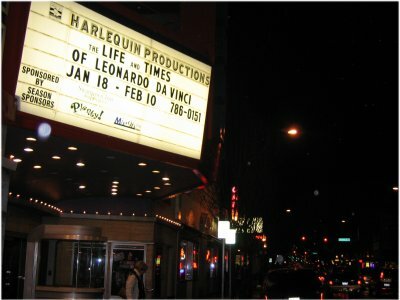 My boss recently suggested I attend the theater to watch "The Life and Times of Leonardo Da Vinci," a one-man act at the local theater. My boss and I are similar, in that we both enjoy learning new things, trying new things, and trying to make sense out of what we know. Apparently, that described Da Vinci's life pretty well. The play wasn't merely a biography -- it was actually promoting the theme of Renaissance, suggesting that a new renaissance was possible. At the time of Da Vinci, the Guttenburg press allowed people to own their own books, inexpensively. It allowed people to read their own bibles and interpret for themselves the words of God. The wealth of Florence, Italy, brought intellectuals from all over the world to compete with one another to demonstrate their knowledge. In this setting, both Renaissance and Da Vinci were born. And today? Is Google the new Guttenburg? Is democratization of the web the new rise of the merchant/middle class? As the power shifts away from corporations and denominational strongholds, the creative genius of the masses will shape our world into something completely new. Do not stop. Do not give up. If you say "this is too difficult," or "I cannot do this," you have stated your motto. Wasn't the play great?? My husband is going to the forum this afternoon, but I have to work. Are you going? I wanted to go to the forum, but I have a late lunch meeting with an old friend and his family. But yeah - I liked it. 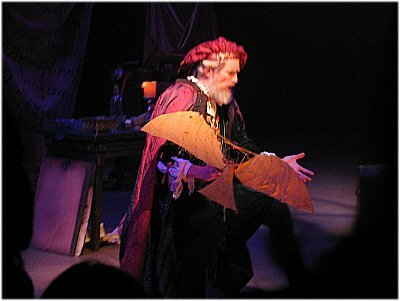 They did a fantastic job with the setting, and Donaldson played Da Vinci well.